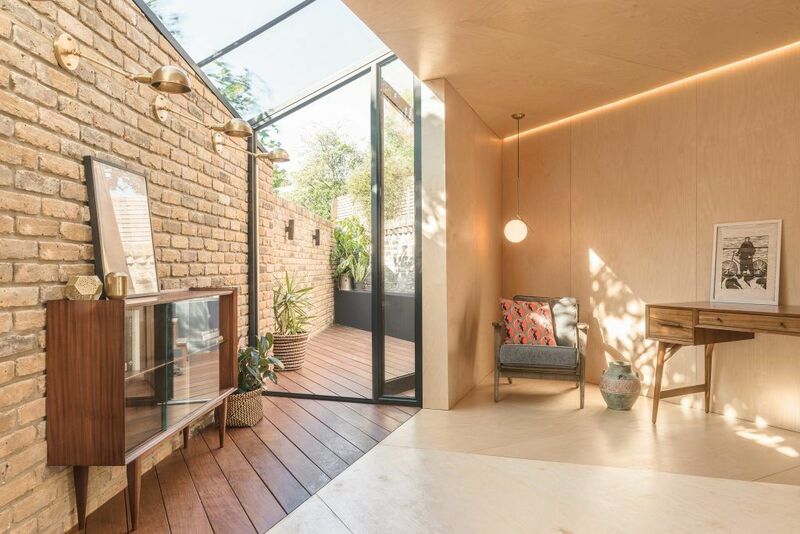 Faced with an awkward space at the rear of a north London property, architects and designers Yellow Cloud Studio responded to the triangular shape by creating a design linking the interior and exterior, using timber elements to bring warmth and texture. The original north-facing back yard received minimal light and felt very cold. Latvian Birch Plywood offered a warm, smooth finish with sufficient texture without being overwhelming in the space. 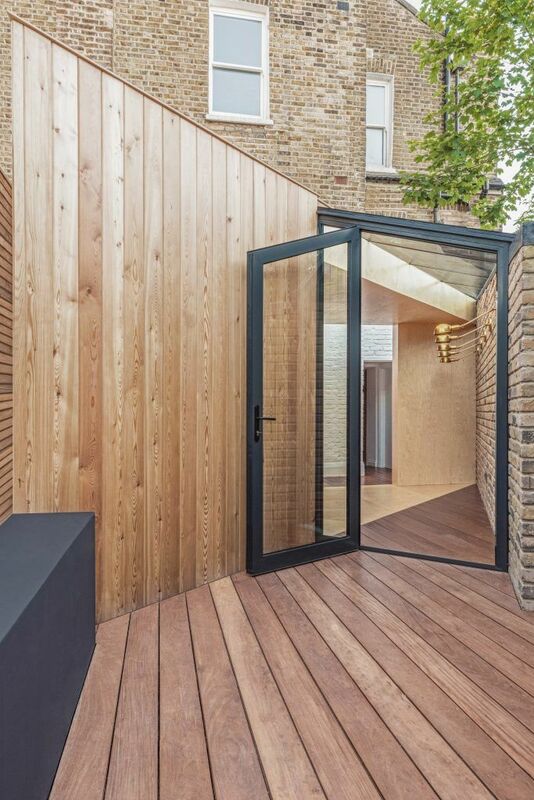 Siberian Larch cladding was used externally for its durability and its natural colouring and weathering properties. 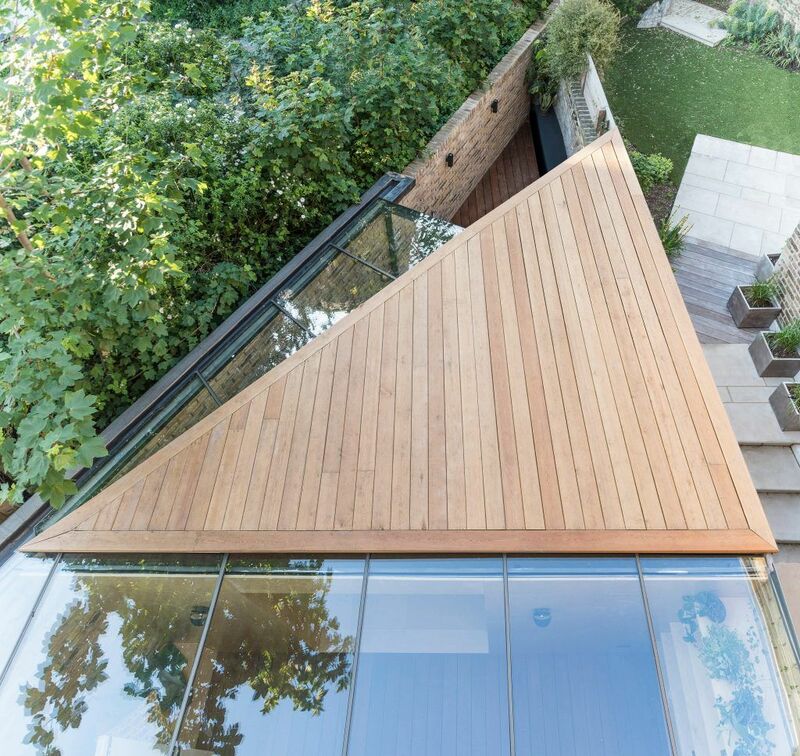 Ipe, a hardwood classed as very durable with a fine to medium texture, was chosen for the decking, giving a complete contrast with the Birch plywood in both texture and colour, allowing the designers to be creative in mirroring triangular shapes throughout the space. Both cladding and decking were sustainably sourced through Timber Trade Federation member Silva Timber. Ipe is a robust but attractive hardwood species originating from the West Indies through to Mexico and central South America. Relatively high in density, it is both strong and resilient, needing no further treatment before use. It is sometimes compared in terms of durability with species such as Greenheart. Its colouring rages from medium brown to olive brown. It is naturally resistant to rot, abrasion and weathering and is an excellent choice for external flooring and decking. It is a lesser-used species with limited availability. Siberian Larch has durability advantages over British Larch, due to the growing conditions in northern Russia and their effects on the resulting wood. Silva Timber is committed to the Timber Trade Federation’s Responsible Purchasing Policy, undertaking due diligence on all their purchasing. The company also holds both Forest Stewardship Council® and PEFC™ chain of custody certification and is a member of the Timber Decking & Cladding Association, approved under its DeckMark and CladMark Quality Assurance schemes. Silva Timber additionally is a signatory to WWF’s Forest Campaign, making public its progress towards full sustainable sourcing of all its products by 2020.